Reception desks, carpets and mid-century furniture found in Midtown Manhattan lobbies informed the design of menswear brand Jack Erwin's flagship store in New York. Jack Erwin and architecture studio Milliøns designed the space at 488 Madison Avenue, in an area synonymous with advertising companies – a reputation cemented by hit TV series Mad Men. In response, the team created the backdrop for the men's shoes, sneakers and leather goods to draw on details associated with corporate office spaces. "Jack Erwin's first retail space repurposes and reimagines familiar aspects of the corporate office to create an environment altogether new," said the brand in a project description. "The store pairs familiar workplace materials – powder-coated aluminium, commercial-grade carpet, teal glass, for example – and bright, bold colours to create a fresh and enlivening backdrop for elegant leather shoes." Among the details used to enhance this aesthetic are the powder-coated, blue-teal aluminium curtains, which are intended to reference office blinds and partitions, and a bold blue square of "commercial-grade carpet" on the floor. Sparse furnishings, such as the dark blue Brno chairs designed by mid-century architect Mies van der Rohe, and waxy tropical plants are used to allude to the minimal decor of Midtown lobbies. The ribbed, white concrete shop counter at the rear of the space, which wraps around a glass cabinet for leather products, is also "inspired by the forms of reception stations", according to the team. Matching this feature, a large central, concrete platform is detailed with diagonal markings. It provides a spot for customers to sit and try on shoes, with mirrors running along the understand to reflect the blue carpet beneath. Modular, white cubes are set on top to provide a display case for shoes, while matching aluminium blocks are also arranged along one wall in the store. Jack Erwin, which was founded by Lane Gerson and Ariel Nelson in 2014, has also continued the workplace aesthetic to the shopping bags. These are adorned with gridded patterns that take cues from Excel spreadsheets. 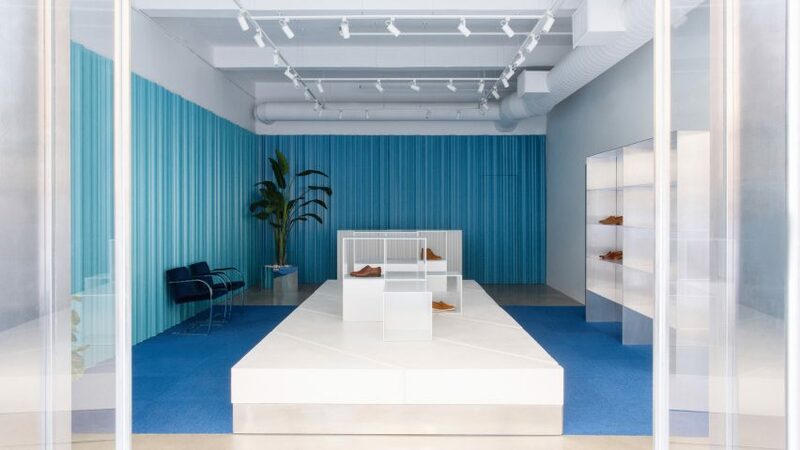 Other design-focused retail spaces that have recently opened in New York include shoe brand Gray Matters' showroom in Brooklyn, which features a series of trompe l'oeil mirrors, and Claus Porto's boutique complete with a crinkled tunnel. Photography is by Matthew Johnson.